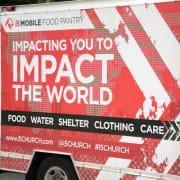 HOMELESS MOBILE SERVICE UNIT Need: In Anne Arundel County the homeless often suffer from the lack of ability to access even the most basic needs. Unlike urban centers, suburban areas do not have the resources or the transportation needed for those who find themselves on the street in a homeless situation. Anne Arundel County has of a half a million residents, with limited resources for the homeless. What we do: Each month mobile service unit goes out to multiple locations where they homeless live and administer the services. Our trailer is fully portable and can literally pull up anywhere without needing access to power. We are also able to use this trailer as disaster relief service unit as needed. We just started Mobile Drop-in / Afterschool Program. On Wednesday and Thursday from 2:30 to 5:00 both days in a library please contact the office for more info!